I finally picked up my needles again yesterday, after what was evidently far too long away. 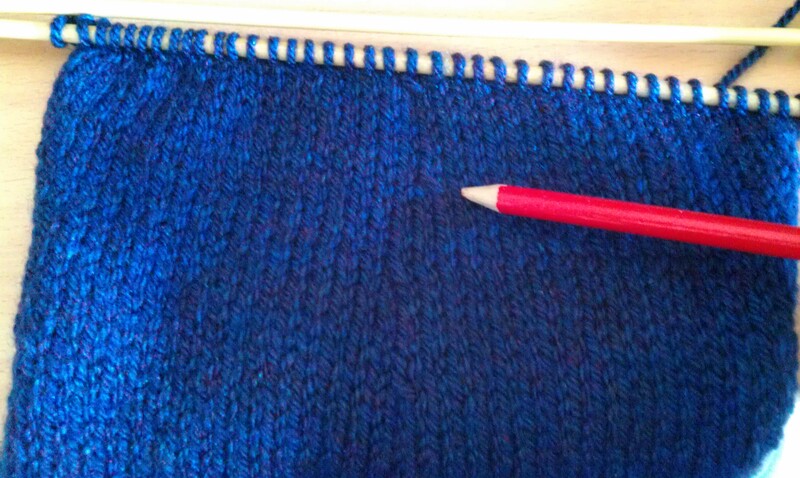 I knitted around 10 or 12 rows, including a couple of decreases and then counted my stitches. I checked against the pattern. I counted again. I did a little maths. I was very confused. Somehow it just wasn’t adding up correctly, even though every other stage seemed to be correct. The maths in the pattern was definitely right, but somehow my stitch count didn’t match. I put it down and walked away for a while, but continued to mull over the problem. That’s when I thought to look a little further back in the pattern and realised my mistake. For the last 12 rows, I’d been looking at the wrong size numbers in the pattern. My final stitch count was in fact correct (yay! no frogging), unfortunately my decreases were not (boo, frogging). Given that they don’t line up with the previous decreases, it’s too obvious a mistake to just leave, so it’s time to figure out the best way to frog back 12 rows without messing the whole thing up and having to start again. Knitting, and well, crafting generally has gone on the back burner recently. We were away on holiday last week during the May half term, with all of my extended family on my mum’s side. There were around thirty-five of us all together, spanning four generations, gathered for a week in West Wales. Every time I talk to anyone about it and see their reaction, I’m reminded what a rarity and privilege it is to be part of such a large family group who enjoy meeting up and spending time together. Spread as we are across all corners of England and Scotland, we don’t meet up often, and doing so is a large undertaking with plenty of challenges – not least finding somewhere that can accommodate us all in one place – but it is so much fun and very much a treasured time and experience. Pumpkin and Pickle especially loved being away, with freedom to explore, cousins to adventure with and plenty of adults to help entertain them and keep them occupied, not to mention day trips out to castles and gardens, topped off with fish and chips and ice cream all together on the most gorgeous little tucked away beach at the end of the week. Coming home has been quite a let down to be honest! On the upside, this week has seen the start of our small building project, so the boys have enjoyed watching proceedings from the excellent vantage point of the front room window. Pickle is on the verge of walking and has just learned how to pull himself up on to the sofa so he can make his own way onto the large windowsill to watch the builders with his brother. Tomorrow are the auditions for the musical that I am hoping to do. I’ve had to dust off my dancing feet and rediscover my singing voice in the last couple of weeks of workshops, but it’s been good fun and I’m looking forward to getting stuck into the rehearsal process. My knitting is still sitting in exactly the same position as it was when I took a photo for my previous post, so it’s definitely feeling neglected and sorry for itself. I’ve been browsing patterns though and have found one that I think I will line up as my next project, so I ought to get cracking really. Too many things to do, and certainly not enough hours in the day.